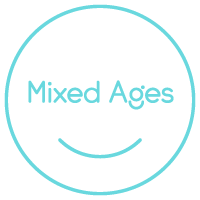 Mixed-age classes have an age range from newborn to 4-years old, which is the model of Music Together®. This class provides a family-like environment that enables siblings to attend together and gives every child the freedom to participate and explore without age specific expectations. Children participate at their own level by singing, moving, chanting, listening, and exploring musical instruments, while caregivers help create an environment that supports children in achieving basic music competence and learn about early childhood musical development. Every family receives a Music Together music collection every semester of CDs, songbook and download code to access Family Music Zone and 'Hello, Everybody' app online; These online & offline resources will help caregivers support the children's musical development by continuing class experience outside classroom.